And so, we meet Isabel, also called Bunjitsu Bunny. This is an early chapter book where each chapter tells a tale of Bunjitsu Bunny. A few of these tales are variations of a familiar story, such as the tortoise and the hare. But Isabel brings her own wisdom and Bunjitsu Bunny skills to the mix, and you end up with something refreshing and fun. 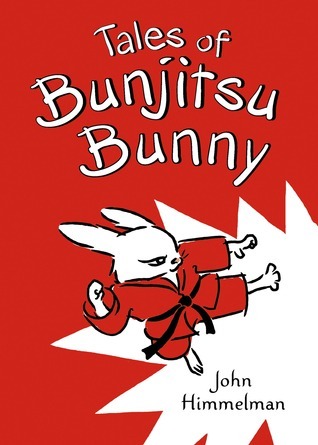 Zen wisdom is woven through the book, but Bunjitsu Bunny’s exploits are never preachy or heavy-handed. Rather, Bunny is charming and spunky and she is surrounded by good friends. For me, this book gave me the same warm, fuzzy, wondrous feeling I get when reading Winnie-the-Pooh or Little Bear stories. Those stories were about animals we could call friends, but they were also something deeper, in that they shared with us truths about life and love and friends. Bunjitsu Bunny’s tale is much the same, with martial arts action and striking art. Very enjoyable, and a book to recommend to those hard to please, reluctant readers.